When I first read Maurice Casey’s descriptions of me and this blog I couldn’t take them seriously. Anyone who knows me — even if only online — knows what absurd nonsense his accusations are. They are nothing but the malicious payback over my temerity to address critically what I believe are the unfounded assumptions and fallacious reasoning behind some of his and his friends’ arguments. Perhaps my biggest sin of all was that I sometimes resorted to “entertaining and somewhat naughty comments”, a bit of gentle satire, to drive home my points when they seemed to elicit nothing but abusive insults in response. “Entertaining satire”, I thought, was more appropriate than repaying insult with insult. “Entertaining and somewhat naughty comments” is Maurice Casey’s way of describing a colleague’s words. He has a different description for mine. A few scholars, among them Jim West, James Crossley, Joseph Hoffmann and James McGrath, have indicated that they seriously believe Casey’s “research” (sic) into the biographical details of various “mythicists” is “valuable” and “informative”. 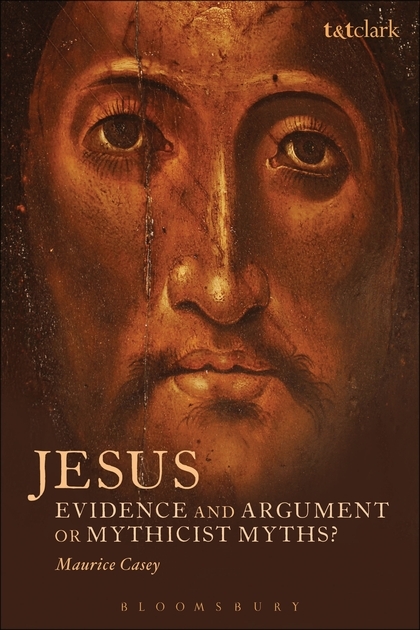 This post tests their evaluation against the evidence relating to one case-study in Casey’s book, Jesus: Evidence and Argument or Mythicist Myth? Anyone can make up their own mind on that one just by reading a few posts. And if you’re not just a lurker but sometimes comment on Vridar Casey says “most of” you are no different. On this blog’s right hand column there is drop down box from which readers can select an archive on any specific topic I have posted about. Listed there are posts to 156 books by various authors, 223 posts in all. Anyone curious enough can select any one of those posts see how often I have “loved to misrepresent” the work discussed and how many times I loved to portray the authors as ignorant. I hardly have to defend myself where anyone interested can see for themselves the facts of the matter. These reviews of yours are so bloody weird! Again I leave it to readers to evaluate the extent of my “special contempt” for Casey from those two posts. Why would the Gospel authors have made it up? End the levity of the previous post. These are my comrades. Why might a study of the Bible benefit someone “not of the faith”? Joel Watts stoops to lies and slander — and doesn’t even care! Oh dear! What half a million books thrown on the floor by an earthquake look like . . .
Why Haven’t Muslims Condemned Terrorism? Since Joseph R. Hoffmann (sic) joined with Stephanie and me to write preliminary essays about mythicism, [‘Blogger Godfrey’ has] attacked him too. Maurice Casey’s quality and depth of research into his targets reminds me of some of the more laughable fiascos of our federal spy agencies on students back in the ‘radical 60s’. He begins by saying I am “apparently Australian”. If he had any doubts he could always asked me and for any confirmation. He then takes a guess at my age and finds it significant to document that I was once divorced and that I also had children. Perhaps Casey didn’t realize that when I was metaphorically describing my new religious experience I was actually talking about my rejoining the ranks of Anglicans and liberal or progressive Baptists. I am sure he would not have wanted to accuse many of his associates who enjoy allegiance to the same mainstream Christianity of being in “total contempt for critical scholarship”. Perhaps he was misled by my passing remark that I discovered I could speak in tongues. That was true. I did it once. In private. I satisfied my curiosity that the phenomenon was psychologically induced and never repeated it. Casey perhaps read as much as he wanted to in a throw-away comment of mine that was directed at a particular audience and context. So what was Casey’s source for all of this? Much of the information which follows was taken from Non-Believer Former Members of the Worldwide Church of God. My contribution was one of many “testimonials” or “stories” volunteered by ex-members of the Church. The audience consisted of other former members. The purpose was to offer some encouragement to ex-members by reassuring them that they were not alone in their experiences and to see the various ways others had carved out a new life after they left. The 1437 words of my story were almost entirely describing how I moved from the Church into atheism. I am describing my journey towards atheism. I highlight the stepping stones along the way. I wanted to share the hope and fulfilment that I found in my life as a result of this journey. What can one say to that when the entire story was about my conversion to atheism? Casey only sees what he wants to see. Its importance is that he has had two conversion experiences, and this means that his contempt for evidence and argument as means of reaching decisions about important matters is central to his life. As I said above, that second “conversion experience” was my rejoining the ranks of mainstream Christianity. It was evidence and argument that led me out of the Worldwide Church of God and eventually into atheism. It might be worth mentioning something unusual about the Worldwide Church of God (WWCG) itself. After the death of Herbert W. Armstrong (its founder) the church was taken into a new direction. I think all the fundamental doctrines that characterized the WWCG as a cult were one by one abandoned. The God Family doctrine was dropped and the Church changed to belief in the Trinity. The Jewish holy days were no longer considered sacred and Christmas and Easter were observed instead. Tithing was dropped. Divine healing was no longer a teaching. Forget the Jewish dietary laws, too. I don’t know if they also now worship on Sundays instead of Saturday. The Gospel itself was changed from the coming of the future kingdom of God to earth to being focused primarily on the death and resurrection of Christ. Herbert Armstrong was no longer the “prophesied Elijah” or “sole end-time Apostle” but (members were told quite bluntly) had been seriously mistaken in his teachings. As one would expect many members left and went in all sorts of directions. I left in the very early stages of some of these changes. It was still very authoritarian at the time and what I saw looked more like the Stalinist politburo than a real “church of God”. How could one possibly say God inspired one doctrine in one year and the opposite one the next? People had given their lives, sometimes literally, for beliefs they were now being told were false. What was important, as far as I could see, was not what one believed but when one believed it. It was all about timing. Believe the right thing at the wrong time and one would be disfellowshipped — cut off from all one’s friends and possibly even family. I suspect what’s left of the church is no longer authoritarian as it used to be. The point is, I think, that there’s a lesson there somewhere for those who try to say that fundamentalists can never change. Casey could have known all of this had he had a competent research assistant. I might finish this off at some future date. Posted on 2014-10-23 11:17:21 GMT+0000 by Neil Godfrey. This entry was posted in Uncategorized and tagged Casey: Jesus, James Crossley, Maurice Casey. Bookmark the permalink. Casey is simply applying the standard of Biblical research he used when psychoanalysing the motives of Judas Iscariot to you. So we can read his book, see how wildly inaccurate he is about living people and then wonder about his legendary powers of telling us what people of 2000 years ago were motivated by, their history and deeds. Neil, when I first saw our names in print (i.e., featured prominently in Casey’s screed), I managed to resist the urge to take it personally. I did and still do consider it a badge of honor to have irritated a few ill-informed and ill-tempered hacks. Yet despite the efforts of biblical scholars like Bart Ehrman, Maurice Casey, James McGrath, and others to expose the methodological weaknesses of the Mythicist position, there seems to be no end in sight to the phenomenon. No need to expand on those “efforts,” of course. They’re simply part of a summary statement — part of the evidence that we are invited to consider as already submitted. The target readers aren’t supposed to go and read anything; they’re simply supposed to nod dutifully, remember the names, and receive the Truths that mythicism has been decisively refuted and mythicists are incorrigible. ….don’t forget “foolish and incompetent”! What I find most interesting, and revealing, is Casey’s apparent hatred for Christians of the non-SBL variety; his insinuation that there is something mentally wrong with anyone who undergoes a religious conversion experience. I imagine that there was great disappointment when the general public failed to recognize Casey’s prophetic genius in deciphering the original Aramaic gospel, an intellectual feat for which he felt he deserved the highest awards and greatest of fame among Christians worldwide. In relieving some his anger by shaking an angry fist at mythicism, he inadvertently let loose some long-repressed rage at Christians, too. There was a review of Maurice Casey’s book in the recent ‘Church Times’ published in England. Addresses Casey’s credentials. He is an academic of “world stature in the field of NT studies”; since he left the Christian faith he is able to speak with a “certain objectivity” which a professing Christian may seem to lack. Casey “takes the lid off a whole world of NT discussion on the internet.” It’s uncontrolled and everything bad that does with that. Casey here sets himself against a school, perhaps a shoal, of bloggers who are intent on showing that Jesus Christ never existed; he was a complete myth. Casey contends that this shoal relies on secondary soruces which are now outdated and were unreliable even in their own time, and that the bloggers simply lack the elementary skills required to use and evaluate primary sources. The book in fact addresses mostly non-bloggers: Murdock, Doherty, Freke and Gandy, Harpur, Wells, Thompson, Zindler. Some of these have websites but I don’t think any of them have blogs. My impression is that the reviewer is not familiar with the internet discussions and registered little about them as a result of reading Casey’s book. Presumably the review was the response to being sent a review copy by the publisher. The only bloggers I know of addressed by Casey are, as he himself addresses them, “Blogger Carr”, “Blogger Godfrey” and “Blogger Widowfield”. Perhaps the preponderance of Casey’s attention to a couple of these names created the impression that Casey’s targets were all Bloggers. This is all part of the ‘Criterion of Historical Plausibility’, which shatters the bloggers’ ill-documented claim that the whole story is simply a repetition of the ancient myths of other cultures. The tone of Casey’s vigorous argumentation is clearly shaped to match that of his opponents and at times an even be a little shrill; but it is crystal clear that their grasp of the material is no match for his. Of course it is crystal clear if one has never read it and relies entirely upon Casey’s claims to have presented it.